In our world today, it is easy to feel as one is overlooked or not slender enough. The feeling of not being "enough" is very common in our society today with standards that are impossible to live up too and media that bombards us daily with images of women that we "should" be. 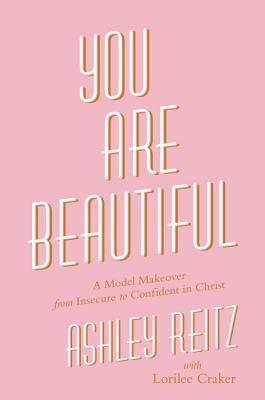 Yet, these are all lies and Ashley Reitz dispels the lies as a model in "You are Beautiful." She lets the reader into a world where she too faced the lies of perfection, weight issues, insecurity and wanting to look perfect as a model. However, she has come a long way in her journey and has wrestled with this battled. Her message, "You are beautiful! " Reitz hits on a variety of topics including perfection, confidence, beauty, body image and identitiy. In the end, she wants the reader to grab their Bible, listen and take the word of God in as truth and the most important media, rather than listening to society. If we would stop focusing on the world around us and see us the way God see's us, we would love ourselves and have a healthier image of who we are in Christ and his purpose for us. This book is perfect for tweens, young adults or college age students. It would be perfect for those who are in those formative years and are struggling with who they are. However with that in mind, this book has amazing truths for a woman of any age, especially as this book is full of encouragement, told from a Biblical perspective and is a quick read. I highly recommend it. I give this book 5/5 stars. A favorable review was not required. Ashely Reitz works with top agencies as a "curve model," offering her a platform to promote a healthy body image to young women. She has been an ambassador for a popular movement called Healthy Is the New Skinny and has been on the board for Miss SW Florida USA. Ashley has appeared in major magazines such as Seventeen and in national ad campaigns for Avon, Macy's, and Saks Fifth Avenue. Along with her "match" B.T., she was a fan favorite on FOX TV's reality show Coupled. Follow her at ashleyreitz.com.